Bitmap files have a .bmp extension and have the highest possible resolution. The Software presented here can be used as a bmp to jpg converter. The Software allows to convert single or multiple .bmp files to .jpg files really easily, quickly and the conversion is done really fast. A Batch File conversion can be done by just dragging .bmp files onto the software and on the click of the convert button. You can even use the software to convert .bmp files to .png or .gif as well. Converting bmp files to jpg, png or any other format when done with a desktop software utility can be really fast as compared to the conversion done using an online bmp to jpg converter. 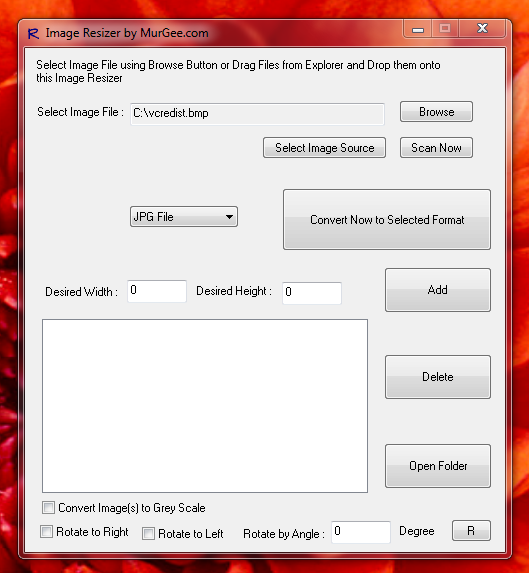 The File Conversion is one of the features of the Image Resizer Software Utility. Single or Multiple bmp files can be dropped onto the interface of the software and the Convert Now button can do the required task of converting bmp files to jpg files in a matter of seconds. The Software can also resize the images if appropriate image resolutions are added to the list of target image resolutions. Initially the software presents the options to resize image files to 800 by 600 resolution apart from doing the image conversion. Just Select the 800 X 600 Resolution and click on the delete button if you do not want your images to be resized and converted. Just drag bmp files from windows explorer and drop them onto the software and then click on the Convert Now button to convert bmp files to jpg files. There is no limit in the number of files that can be converted and there are no reminders to purchase the software. The Software is free to download and try and works fine on almost all latest versions of Microsoft Windows including Windows 8, 7 , XP , Vista , etc. Download this multi-purpose Image Editing tool and use it as bmp to jpg converter to convert any number of bmp files to jpg files in a batch.